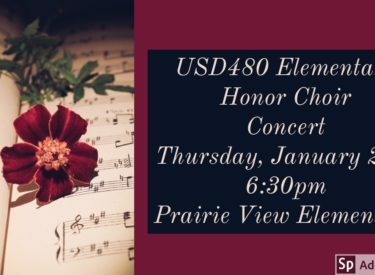 On Thursday, January 24th at 6:30pm, the USD 480 Elementary Honor Choir will perform a community concert at Prairie View Elementary School. Admission is free. The Elementary Honor Choir is made up five 5th grade students from each of the elementary schools. These students have attended extra after-school practices to prepare for this event and are excited to perform their selections . P lease join the USD 480 Elementary Honor Choir for a fun evening of singing!